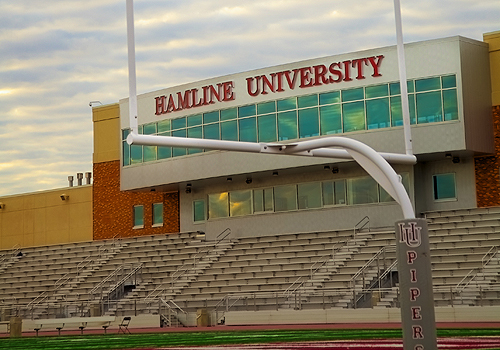 A premiere athletic venue and home to Hamline's football and track and field teams. Pipers score touchdowns on the field's Prestige synthetic playing surface, which combines the traction of grass and the all-weather capability and usability of synthetic. The track team runs to victory on the nine-lane, 400-meter Mondo track, the most widely acclaimed track surface available. Fans cheer on the home team in Klas Center's stadium bleachers, which seat 2,000. Along with the Klas Center, Klas Field is named for Robert Klas '52 and Alexandra "Sandy" Klas, who donated $7 million to Hamline for the facilities. Robert is the chairman and CEO of Tapemark Company. He is also the founder of the Tapemark Charity Pro-Am, a nationally recognized annual golf tournament that raises money for children with special needs. Sandy is a Twin Cities artist and long-time advocate for persons with special developmental needs. She has been a board member for many nonprofit agencies for the disabled, and is a former president of Learning Disabilities of Minnesota.